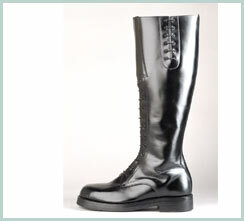 Nick’s RCMP Boot – Black high shine police grade leather or dark brown leather. Fully leather lined. All sole options available, Vibram styles or leather. Elasticized laces. Spacers available. Priced from $525.00 Cdn.